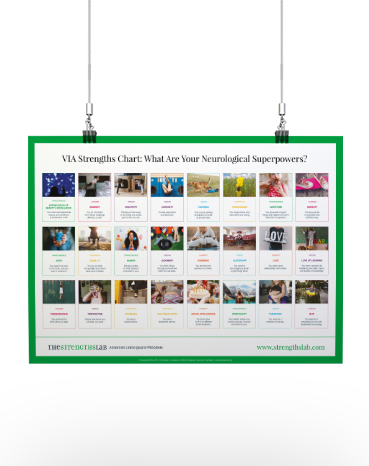 Build a shared language of strengths by helping people to better understand each of the 24 character strengths. 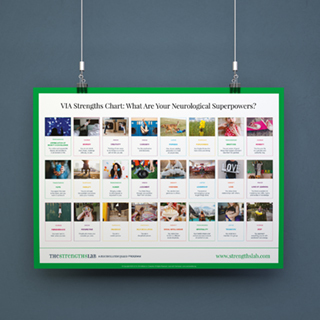 Make it easier for people to identify their neurological superpowers so they can do more of what they do best. Ideal for individuals, teams, teachers, coaches, and facilitators, this poster is great way for people to remember and develop their strengths. An A1 size to place in the office kitchen, team area, your study, or the classroom wall. It’s the perfect strengths guide. An A3 size that’s easier to print and place on the fridge, in front of your desk or keep in your notebook. It’s the perfect strengths cheat sheet. *Please note this is a digital product – you will not be sent an actual printed poster, but you’ll get everything you need to print the poster as many times as you want on your own. You will receive an email and access to the materials in the membership area.